Should the media include positive editorial content secretly paid for by major corporations, as London’s Evening Standard newspaper has begun doing, according to new revelations? Most of us instantly recoil from any blurring between editorial and advertising in the media. How would we know if what was reported was factual, truthful and newsworthy or there simply as public relations spin? How could we trust anything we read? But here’s a seditious idea. Would that be such a bad thing? Maybe it would better if we were far more wary of the corporate media and began to think of it chiefly as a sales platform – selling us an ideology harmful to our individual welfare and that of our societies. But before we continue with that line of thought, let’s first recap. James Cusick has an important article on the Open Democracy website about a £3 million agreement between the Evening Standard and six major corporations, including Google and Uber, to let them buy favourable news coverage and commentary. The project, called London 2020, offers these corporations the chance to covertly influence the paper’s nearly 1 million readers in London. The idea is the brainchild of George Osborne, the paper’s editor. It is perhaps not surprising that it has been left to Osborne to clear the path for newspapers to become more overt cheerleaders for major corporations. For six years prior to 2016, he was chancellor of the exchequer (Britain’s finance minister) for Conservative governments overseeing strict economic austerity, a policy designed to bleed the British public of money that was used instead to revive the private banking sector and major corporations. Additionally, Osborne has his finger deep in various lucrative corporate pies. In a blatant conflict of interest since he became the Standard’s editor last year – and one that predates his offer to sell favourable coverage to these six corporations – he has a £650,000 contract to work one day a week for BlackRock, the world’s largest fund manager. BlackRock, meanwhile, has a £500 million stake in Uber – the taxi-app company that is among the corporations that signed up to Osborne’s deal. Uber desperately needs an image makeover as it fights through the courts to keep its licence to operate in London. What is good for big business is very good for George Osborne’s bank balance. Which is why Osborne’s commitment to real journalism comes a far second to his commitment to his pals in the City. Nonetheless, it would be foolish to imagine that this is really a battle between Osborne’s slash-and-burn economics and journalistic ethics. First, we should remember that all corporate media have been blurring the line between editorial and advertising over the past two or three decades. In the past they called it “sponsored content” and advertorials. More recently it has been transformed into “native advertising” – a euphemism for media outlets prostituting themselves to large corporations. Osborne’s crime is simply that he is doing it more brashly and on a larger scale than his competitors. As the statement implies, Starbucks are not averse to manipulating public perception of their activities to counter a poor image – in their case, because they and other corporations have rigged the UK system so that they pay hardly any tax. But the company was worried that Osborne’s plan might backfire. Presumably they suspected that this dishonest deal would eventually become public – as it indeed has – and would further dent their image. Or, to use their terminology, it risked becoming “PR death”. As one should expect, the only consideration when corporations try to influence public opinion as they pursue their relentless battle to maximise profits is whether the effort will prove beneficial. Not whether such efforts are honest, or ethical, or in the public interest. Only whether they work – whether the public will think better of the company as it seeks to increase its profits, whatever the costs to the rest of society or the planet. In fact, far more sensible than the Evening Standard’s plan for each major corporation to make a one-off deal with a newspaper is for them all to have a permanent, collective and invisible deal with all media outlets – to promote a business environment that allows them to maximise their profits. And that is precisely the situation we already have. It is not primarily because the media is dependent on advertising, though, of course, that helps to ensure the corporations get their way. What newspaper or commercial TV station is going to attack the very corporations they depend on for the bulk of their income. Attacking these corporations would be the media’s equivalent of shooting oneself in the foot. But more significant still, the media are themselves corporations, no different from Google, Uber and Starbucks. Jon O’Donnell, the commercial director of ESI Media, which publishes the Standard as well as the Independent newspaper, alludes to this in a statement cited by Open Democracy. What Osborne and O’Donnell have done is make explicit what was until now largely veiled. The media aren’t just dependent on advertising from corporations. They are corporations – enormous ones. 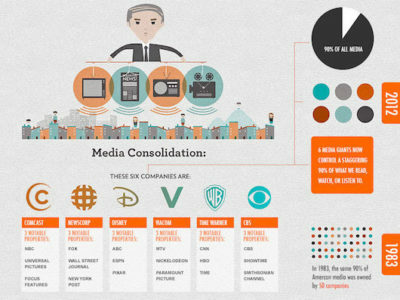 Today, six media corporations own 90 per cent of all US media. That destroys even the pretence of media choice and pluralism. But it signifies much more. It ensures that these massive media corporations share the ideological assumptions of other major corporations, because all of them are driven by the same two considerations. First, to maximise their own profits whatever the external costs, including to the real world. And second, to maximise profits while minimising the damage to their carefully crafted public reputations for being ethical or caring companies pursuing the public good. That means the core activity of media corporations is to act as the public relations arm for a turbo-charged neoliberal ideology that sanctions the pillage and plunder committed by all corporations – including media corporations – in the pursuit of endless “economic growth”. The superficial differences between the various media outlets are there only to persuade us, readers and viewers, of yet another myth: that we have choice and control over the media, and that there is some kind of healthy debate taking place in our societies expressed through a supposed media “pluralism”. The reality, however, is that our choice is between two wings of the corporate public relations industry: one advocating a confident corporate capitalism unapologetically pursuing activities that are destroying our societies and the planet, and another apparently committed to making minor adjustments to corporate capitalism to slow down – but not halt or reverse – the ongoing destruction. Through adverts and editorial, all corporate media lobby relentlessly in favour of a mythical – and suicidal – endless “economic growth” and for an intensification of consumerism as a panacea for the very troubles inflicted by consumerism on our societies. Regarding the most vital issues we face, there is already no distinction between the editorial and advertising sides of the media. Lonely and depressed? Spend more time on your smart phone that isolated you from meaningful relationships and that bombards you daily with messages telling you that you will be happier if you improve yourself, or at least distract yourself, by acquiring more things. Want to save the planet? Salve your conscience by ditching your old, polluting car and buy a greener, hybrid car. Soon you’ll need to trade that in for an electric model. Later you can scrap that one to buy a more efficient vehicle running on hydrogen, or maybe pixie dust. And while you’re pondering a greener lifestyle, maybe we can sell you a top-of-the-range bicycle and accessories. Corporations are now so much in charge of our societies that our main political parties – whether nominally of the left or right – represent their interests above all else. It is no accident that the Evening Standard’s London 2020 campaign to promote these planet-destroying corporations as our allies was timed to coincide with the London mayoral election. What better idea than to use the corporate media to sell us the idea that other profit-obssessed corporations are really there selflessly to help improve life in London. If the campaign is successful, those same rapacious corporations will have even more leverage over the winning mayor than they do over the present incumbent. What is happening in London is occurring in every city, from New York and Los Angeles to Paris and Frankfurt. And it is being replicated on the national level. We will remain powerless over our lives as long as the corporations have power over our cities and countries – and our media. So let Osborne sell the Evening Standard’s soul to the highest corporate bidder. In truth, the newspaper had no soul to begin with. It is time we ditched the Standard and the rest of the corporate media, and created new models of a pluralistic media that represents us, not billionaires.